If you have read the previous two books in the series you know that this book is happening at the same time, but from Dell and Taro’s perspective. We finally get to see what is going on with Dell, who is so quiet in the first two books, but we all knew something was going on. I really liked the connection between Dell and Taro. I even liked the emailing back and forth, which is shocking for me because I am a huge dialogue person, I hate inner monologue stuff. I am also not big on asexual books or demisexual books. I will say this one did explain things in great detail; but at times, I thought it was a bit preachy or more like Taro was on his soapbox. I did enjoy the book and the story was great. I can’t wait to see what the next book is about. I haven’t read the previous books in this series, but when I read the blurb for Uniquely Us I had to give it a read. I started the book hoping that I wouldn’t be too lost and was pleased that I had no issue reading it as a standalone. While I may have missed out on some of the subtext of what was occurring between Chet, Cris, and Jake, the romance between Taro and Dell was what I was interested in and I absolutely loved it. It’s not often that I comment on a book’s title (and I might never have before), but I think Arthur absolutely nailed it with Uniquely Us. Taro and Dell both have an exceptional amount of emotional baggage that has shaped them in significant ways – some of it is so overwhelming that it’s easy to understand why neither man expects to have a relationship, ever. Yet a chance meeting at a mutual friend’s birthday party brings the unlikely pair together – and when you read the book you’ll understand why I call it a chance meeting. As the two strike up a friendship and learn more about the other, each man learns more about himself and finds the courage to change how they approach the world and their place in it. Because both men are asexual, there is no mad dash to the bedroom and this is especially important for Dell’s growth during the novel as he not only has to come to terms with the fact that he is asexual (and not broken), but Taro’s demisexuality serves to show Dell that another man can be interested in him for who he is as a person and not as a sexual being. At the same time, Dell gives Taro the freedom to be who he is and encourages him to step outside of his routines without being pushy about it and he’s understanding when Taro cannot. Neither judges the other for their “oddities” and this makes for an enriched environment for their relationship to develop into more than friendship. Because I haven’t read the previous books, I’m only going to say that there are some shocking revelations in this installment (I wouldn’t want to reveal spoilers for an earlier book) and they rocked Taro and Dell’s relationship more than once. Fortunately, the support system they had in Chet, Cris, and Jake enabled them to move past the shocks and use them to strengthen their relationship. Much like Dell, I had no understanding of what asexuality was until someone else informed me of it. Unlike Dell, I came to the realization of my own asexuality far later in life – my forties. Because of my personal perspective, I actually hurt for Dell as he had to come to terms with his asexuality. However, as a female, I cannot begin to understand the pressures placed upon a young man coming to terms with being asexual because even though societal attitudes toward women being more sexually active have changed over the past few decades, there is still a substantial amount of pressure on men to be sexually active and even more so in their youth. I’m just glad that Dell had Taro to guide him to understanding that there was nothing wrong with being asexual and most importantly, that asexual does not equal broken. As for Taro, the psych student in me LOVED delving into his anxiety and OCD and the routines he developed to cope with the world. Even better was watching him embrace a reason to break out of his routines and do so successfully. I absolutely loved Uniquely Us and hope to go back and read the previous books in the series… eventually. Until then, kudos to Arthur for writing such a beautiful romance that shows how asexual persons can have a loving and sexual relationship. 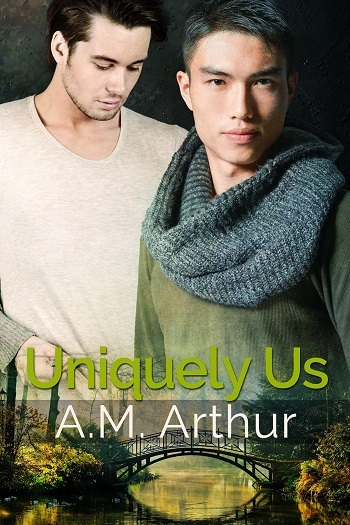 Reviewers on the Wicked Reads Review Team were provided a free copy of Uniquely Us (Us #3) by A.M. Arthur to read and review.